Wednesday nights my daughter, Amber, my SIL Paula, and I get together and craft. Right now we are busy crocheting projects and will try other crafts soon. Paula is a crochet genius and can make anything even without a pattern. She makes up a lot of her own designs. Here are some items I worked on during the evenings last week. 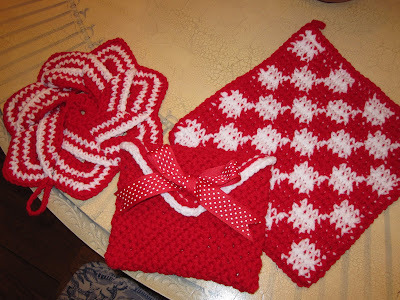 The spiral pot holder is mine and the checkerboard pot holder and crocheted envelope I did for my daughter for Valentine's Day. Last night during craft night I took it easy and simply worked on my afghan that I started about 3 weeks ago. Paula worked on these very cute and extremely tiny pieces for Amber to make into ear rings. The tiny granny squares are approx. 1 inch in size. Amber will starch these to stiffen them and then add the wires for the ear rings. Amber made some a couple of weeks ago with Paula's guidance. She's a great instructor! I wish I had photographed the cute hat that Amber made, but I forgot. I will share it with you or link to her blog when she posts about it. If you've never done craft night give it a try. It's a great way to complete those unfinished pieces and visit with each other. I finished this little painting that I mentioned in my pervious post. It is now listed on eBay. 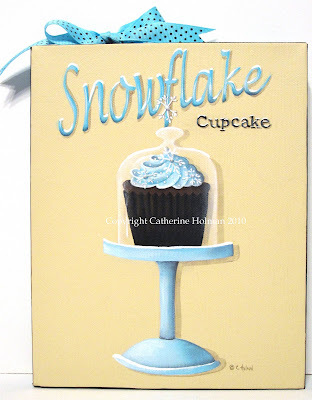 A scrumptious dark chocolate cupcake is topped with turquoise piped frosting and accented with delicate white snowflakes and tiny white sprinkles. This whimsical creation is displayed on a turquoise cupcake stand and covered with a glass cloche. A turquoise and brown dotted grosgrain ribbon wraps around the edges of the canvas and is tied in a bow at the top. I hope you are all safe and warm! There's nothing like record snowfall! Now that's a great way to socialize...all around a craft evening. Cute crocheted items! Cute crochet... I like the painting too...looks like a poster! craft night, what a great idea! About 25 years ago I belonged to a group that met once a month and created something....we make a corn husk wreath, a kitchen witch, pottery Christmas decorations and more. It was alot of fun! I envy anyone that can crochet. Wow are you all so very crafty! I love all the red and white for Valentine's Day!! I love the snowflake cupcake also! Keep up the wonderful work! isn't that pretty! and looks delish! I love red and white combination. I love the idea of the craft night too. 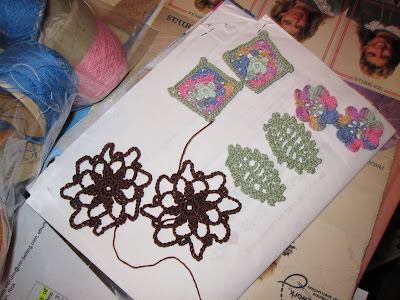 You are always a one crafty lady..Everything is just beautiful that you make...Even sounds like your daughter Amber is following you in your foot steps..I also been following her blog too..Thanks for sharing her blog on yours.. I just love stopping here and seing what you been up too.. Being from the South, I didn't expect to be a part of the blizzard that hit our country. But yesterday we had about four inches, which for us is very unusual. I love your snow cupcake... very fitting as my backyard is covered with the fluffy white stuff. But temps are to reach mid-40s today, so it will all be gone by tonight. Loved the crocheting. I have only ever crocheted a string, but would love to learn to do more. Thank you for your advice on baking. I'm afraid to say that I am even more so, a worse crafter. I admire your talent though. 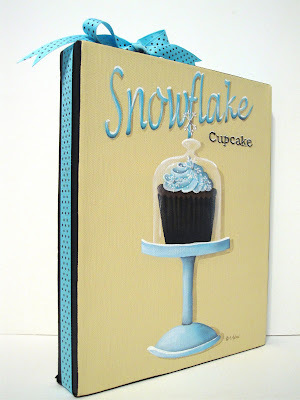 Very nice crochet pieces, and I another great cupcake painting! It looks like you gals had fun and got a lot done! The crocheted items are beautiful as is your snowflake cupcake. I wish I had some girls to do a craft night with! Lovely and sparkly cupcake Catherine...I love your craft night, love the crocheted work. Love this! My mom and I have been talking about doing this for YEARS! Nothing better than girlfriends & creativity mixed into one! And, as always - your painting is darling! A "spot" of inspiration you always provide! It's me artgirlATL! I have a new blog home. I linked you there. Cause I',m nuts about your blog. Hugs! Love the craft night! I do some kind of stitching every night. It would be great to have craft night. I can't wait to see your afghan you are crocheting. I am making one right now for one of my daughters friends. I adore your 50's lady in the red and white polka dotted apron holding the cupcakes! What a great and creative design. This is my second week back to work since my foot surgery and so I haven't been able to read my favorite blogs as much. It's lunch time so I'm able to write you this note. Take care and enjoy your day~keep creating!